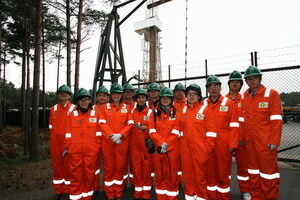 On October 25, the Press Section of the Chinese Embassy in UK organized 11 journalists from 9 Chinese media based in UK to visit Wytch Farm Oilfield of British Petroleum (BP) . Mr. Zhao Yuanheng, head of Corporate Communication of BP China specially came to UK to participate in the visit. Ms. Suzie Baverstock, head of Environment and Communication Affairs of BP headquarters in UK welcomed the journalists on behalf of BP. She introduced unique extended reach drilling of Wytch Farm Oilfield and diversified measures of BP to protect environment. She noted that BP paid close attention to the protection of sensitive local ecological and geographical environment and tried to keep the impact to minimum level. The journalists visited the oilfield with great interests and had a deep impression on the extended reach drilling technologies of BP and consciousness of BP about environmental protection; they thought that these were examples for relevant domestic enterprises. Xinhua News Agency, China News Agency and Phoenix TV will report this visit. The journalists thanked press section of the Chinese Embassy for organizing this visit which was meaningful; they hoped that the Chinese Embassy could organize more similar activities in the future.